President Donald Trump on Tuesday released a statement about the importance of standing with Saudi Arabia amid ongoing questions concerning Jamal Khashoggi's death, saying the partnership is vital to pursing "national interests and vigorously contesting countries that wish to do us harm." Trump rolled out his defense of Saudi Arabia by focusing on the damage Iran causes throughout the Middle East and the role the kingdom plays in combating that damage. He noted Iran's proxy war against Saudi Arabia in Yemen, its support of terror group Hezbollah in Lebanon, and how it props up dictator Bashar al-Assad in Syria. He said Saudi Arabia, in contrast, would withdraw from Yemen if Iran agreed to do the same and that the Saudis have agreed to "spend billions of dollars in leading the fight against Radical Islamic Terrorism." Trump reflected on his trip to Saudi Arabia last year, saying they agreed to spend a "record amount" of $450 billion in the United States, which he said would create hundreds of thousands of jobs and contribute to U.S. economic development. Of the $450 billion, $110 billion will be spent on the purchase of military equipment from Boeing, Lockheed Martin, Raytheon and many other great U.S. defense contractors. If we foolishly cancel these contracts, Russia and China would be the enormous beneficiaries – and very happy to acquire all of this newfound business. It would be a wonderful gift to them directly from the United States! He condemned the death of Jamal Khashoggi, the Washington Post columnist and Saudi dissident who was tortured and murdered early last month after entering the Saudi consulate in Istanbul, Turkey. Representatives of Saudi Arabia say that Jamal Khashoggi was an "enemy of the state" and a member of the Muslim Brotherhood, but my decision is in no way based on that – this is an unacceptable and horrible crime. King Salman and Crown Prince Mohammad bin Salman vigorously deny any knowledge of the planning or execution of the murder of Mr. Khashoggi. Our intelligence agencies continue to assess all information, but it could very well be that the Crown Prince had knowledge of this tragic event – maybe he did and maybe he didn’t! The CIA assessed with high confidence that Saudi Crown Prince Mohammed bin Salman ordered the killing of Khashoggi, the Washington Post reported late last week. Trump said in response to the reports that it was "too early" to draw conclusions. State Department spokeswomen Heather Nauert reflected Trump's remarks in a statement on Saturday. "Recent reports indicating that the U.S. government has made a final conclusion are inaccurate," she said. Trump said in Tuesday's statement that his administration and the American people may never know what happened in the consulate, but he said it is important for the United States to continue being an ally to them in order to protect U.S. interests with Israel and other partners in the region. "I understand there are members of Congress who, for political or other reasons, would like to go in a different direction – and they are free to do so. 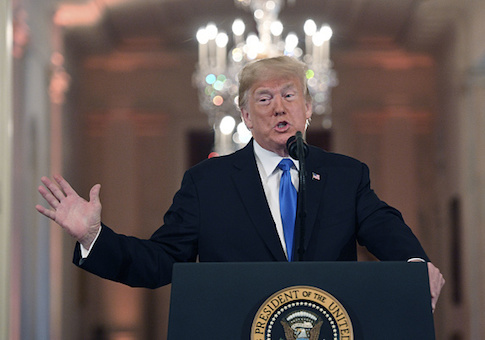 I will consider whatever ideas are presented to me, but only if they are consistent with the absolute security and safety of America," Trump said. "After the United States, Saudi Arabia is the largest oil producing nation in the world." "As President of the United States I intend to ensure that, in a very dangerous world, America is pursuing its national interests and vigorously contesting countries that wish to do us harm. Very simply it is called America First!" Trump concluded. This entry was posted in National Security and tagged Donald Trump, Iran, Jamal Khashoggi, Saudi Arabia. Bookmark the permalink.